In 1934, Veza Taubner and Elias Canetti were married in Vienna. Elias describes the arrangement to his brother Georges as a ';functional' marriage. Meanwhile, an intense intellectual love affair develops between Veza and Georges, a young doctor suffering fromtuberculosis. Four years later, Veza and Elias flee Nazi-ruled Vienna to London, where they lead an impoverished and extremely complicat… ed marital life in exile. 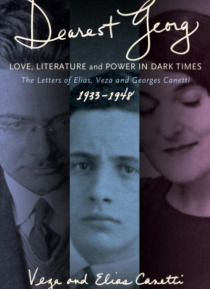 Spanning the major part of Elias's struggle for literary recognition, from 1933, before the publication of his novel, Auto-da-Fe, to 1959, when he finished his monumental Crowds and Power, the Canetti letters provide an intimate look at these formative years through the prism of a veritable love triangle: the newly married Elias has a string of lovers; his wife, Veza, is hopelessly in love with an idealized image of his youngest brother, Georges; and Georges is drawn to good looking men as well as to his motherly sister-in-law. Independently and often secretly, the couple communicates with Georges, who lives in Paris: Veza tells of Elias's amorous escapades and bouts of madness, Elias complains about Veza's poor nerves and depression. Each of them worries about Georges's health–if she could, Veza would kiss away the germs. Georges is an infrequent correspondent, but he diligently stores away the letters from his brother and sister-in-law. In 2003, long after his death, they were accidentally discovered in a Paris basement and comprise not only a moving and insightful document, but real literature.